Swing Cats (SCATS) is the Junior Varsity Mixed Show Choir of Millard West. Swing Cats is composed of approximately 50 freshmen through senior performers. Under Kathy Simpson's direction, Swing Cats put on many colorful, energetic, and engaging themed shows. The Swing Cats are choreographed beginning in the fall of their school year, and learn their music and choreography simultaneously. SCATS rehearses for approximately four hours outside of school during the week. Each year, Dance Captains are chosen by the choreographer and the director of the group. One male and one female member of the group are chosen to lead the choreography and correct any differences among members' choreography execution. Two separate student members are elected to be on the Leadership Team for Swing Cats each year. The Leadership Team is responsible for planning group bonding events, regularly meeting with the director, and maintaining the focus of the group. The Leadership Team is also responsible for collaborating with the Leadership Teams of Uptown Girls and West in the Groove to schedule large group events, and decide what the designated dress is for the day of a performance. The Leadership Team and Dance Captains correspond with each other throughout the year in order to decide how to run rehearsals and how to maintain focus leading up to performances. The Swing Cats show band has approximately seven members. Music for SCATS and the show band is arranged by Luke Furman and Drew Firkins. The Uptown Girls 2016 performing during a competition. Uptown Girls (UTG) is the Varsity Women's Show Choir of Millard West. Uptown is composed of approximately 50 freshmen through senior performers. The Uptown Girls were undefeated by any women's groups they competed against in their 2014, 2015, and 2016 seasons, under the direction of Zack Bjornsen. This winning streak consisted of over 15 competitions and nearly 40 individual groups. It should also be noted that Uptown was awarded the Grand Champions of the Women's Division at FAME Branson during their 2013 season. The most recent defeat by any other women's group was during FAME Nationals in 2013, where UTG placed 8th in their division. UTG rehearses for approximately four hours outside of school during the week. Anne Chapman has choreographed for Uptown Girls since 2012. The Uptown Girls are choreographed during early August with choreography sessions finishing in October. Each year, Dance Captains are chosen by Chapman and Bjornsen. Four members of the group are chosen to lead the choreography and correct any differences among members' choreography execution. Two separate student members are elected to be on the Leadership Team for Uptown Girls each year. The Leadership Team is responsible for planning group bonding events, regularly meeting with the director, and maintaining the focus of the group. The Leadership Team is also responsible for collaborating with the Leadership teams of Swing Cats and West in the Groove to schedule large group events, and decide what the designated dress is for the day of a performance. The Leadership Team and Dance Captains correspond with each other throughout the year in order to decide how to run rehearsals and how to maintain focus leading up to performances. The Uptown Girls show band has approximately 18 members. Music for UTG and the show band is arranged by Luke Furman. West in the Groove (WIG) is the Varsity Mixed Show Choir of Millard West. WIG is composed of approximately 50 sophomore through senior performers. In 2005, West in the Groove earned their first Grand Champion placement under the direction of Joel Johnson. Kathy Simpson had a very theatrical style of directing that was evident in the show choir shows she produced. Each year, WIG's shows would have a theme that all the songs would adhere to. Simpson also developed their use of "novelty" songs, in which the choirs would perform comical pieces to provoke laughter from the audience. The novelty songs were a trademark of Simpson's style, and continued to surface throughout her direction. Simpson's theatrical style included the use of quick costume changes, fog machines, and large backdrops. In 2014, Zack Bjornsen became the director of West in the Groove, and brought the group back to a more traditional style of show choir. The first show under his direction wasn't themed, and consisted of a wide variety of music. 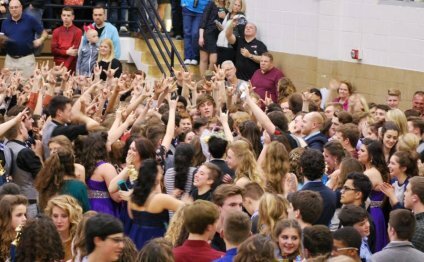 The 2014 season was extremely successful for West in the Groove, as they were placed Grand Champions twice at steep competitions. In 2014, West in the Groove was awarded caption awards for "Best Choreography", "Best Vocals", and "Best Band" more consistently than any year previous. WIG rehearses for approximately four hours outside of the school during the week.